Interview with Ashleigh Murray of The CW's Riverdale, talking about the Josie episode "Faster, Pussycats! Kill! Kill!" Josie McCoy (Ashleigh Murray) is finally back on The CW’s Riverdale tonight (March 2) after conveniently missing her “girl” Cheryl’s brother’s memorial. No word on where Josie had been, but what we do know is that tonight’s episode is very big for her, as we finally even meet her dad and learn more about what makes Josie tick. Did we mention long tails and ears for hats? While Josie goes through a few crises this week — one of them being the defection of Valerie (Hayley Law) — we also get more insight into the strong relationship between the leading Pussycat and her mother who also happens to be the Mayor of Riverdale, as played by Robin Givens. It’s interesting to note that Mayor McCoy has a wealth of support for her daughter’s music but when Mr. McCoy is also a musician, she has no support of his musical dreams. Why is that? “I think that has to do with the fact that Josie is her daughter and there’s a certain type of love that you have for your child that you don’t for anyone else, and there’s certain things that you accept and are happy about that you don’t for anyone else, and she feels like she’s had to take over the responsibility of being the mom and taking care of the household and being the dad while he’s off living frivolously,” Ashleigh explained. “Second to that, the fact that he doesn’t care about what her daughter is going causes a lot of animosity. So there’s a dismissal of him altogether because he’s choosing to do this life over being with his daughter like she is, even knowing that [Josie] is doing what he wants to do. So I feel like her dislike of him being a musician has more to do with him as a parent and as a person rather than the fact that he’s a musician. And maybe she feels like Josie is actually going to be successful and Josie actually is talented, but he’s not around to see it, so maybe he’s not actually that good,” she continued. On a happier note, tonight’s episode of the show features a big and iconic thing for Josie and the Pussycats – costumes like you’d expect to see from the iconic characters! “I have been asking for that costume since Comic-Con!” Ashleigh enthused. “The second I landed in San Diego and I saw Roberto [Aguirre-Sacasa], I was like, ‘is there any way it’s going to happen? Please tell me we’re going to be in those costumes!’ I wanted to walk around Comic Con in those costumes! That’s the thing: I am so in love with this character and so in love with the things that they’ve done and who they are and who we want them to be,” she said, adding that the suits were specficially designed and pieced together for the individual actresses. 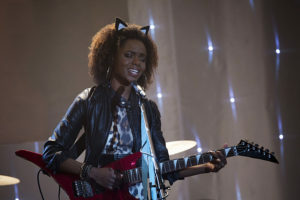 There is one thing that we won’t hear tonight: Even though there is a reference to “long tails and ears for hats,” we do not hear the iconic Josie and the Pussycats theme in the March 2 episode, nor do we hear it at another point in the first season. “We didn’t get to get to the theme song this season,” Ashleigh admits. “We really wanted to but again — please, PLEASE if we get a season 2, that’s absolutely on the table. They were toying around with it for the final episode, but because they had to change the way the story is ending, we’re holding it off for in case we get to come back and start shooting in the summer,” the actress teased. “Faster, Pussycats! Kill! Kill!” airs tonight at 9PM ET/PT on The CW. You can see some photos from the episode here, and if you’d like to see a preview of the Pussycats’ performance tonight, you’re in luck. Also, stay tuned for a new Archie Digest podcast tonight!